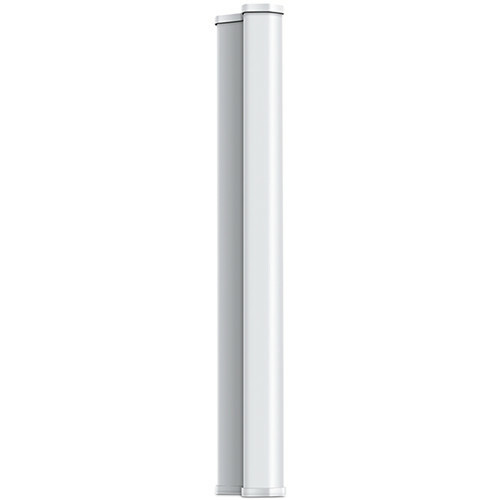 Designed for use with the Pharos Base Station, the TL-ANT5819MS 5 GHz 19 dBi 2x2 MIMO Sector Antenna from TP-Link provides wide area coverage and is suitable for use in point-to-multi-point configurations. Installation of this sector antenna is simple and requires no tools. Once installed, the antenna supports 5.0 to 6.0 GHz frequencies with an impedance of 50 Ohms, a 19 dBi gain, an HPOL and VPOL beamwidth of 120°, and both vertical and horizontal polarization. For enhanced performance, this TP-Link sector antenna supports MIMO technology for enhanced throughput and comes with a weatherproof housing allowing it to stand up to the elements including wind speeds of up to 149 mph. When installed alongside a Pharos Base Station, the TL-ANT5819MS is capable of providing Point-to-Multi-Point data transmission coverage for a large area. This TP-LINK sector antenna features a built-in mounting apparatus and works seamlessly with Pharos Base Stations, meaning that no tools are required for installation. Box Dimensions (LxWxH) 40.5 x 7.25 x 5.5"